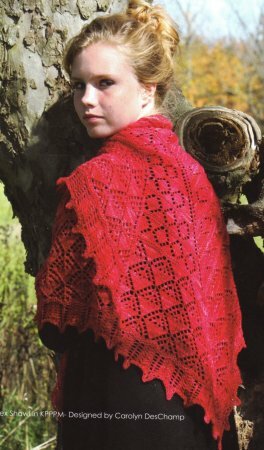 Taken from Koigu Magazine Issue #2: "Shawl is worked from the top down an consists of three parts. First, the Small Diamond section is worked, then the Fancy Diamond Lace section is worked. The last section is a simple lace edging. Graphs are given for each of the lace patterns." Size US 5 needles and a US C crochet hook are required but not included. Finished Measurements: 80" wide x 30" deep after blocking. Gauge: can vary, but will change size of finished shawl. All color options are shown at the bottom of this page. To order, choose your preferred colors and click an "Add to Cart" button. $70.00 -- Kit price including yarn only (no book or pattern). Unfortunately, we do not currently offer the book related to this kit. You can still order the yarn above, however.